Self-regulating heat tracing systems are the preferred choice for most complex pipe-tracing applications. This is due to their parallel construction, which allows them to be cut to length and spliced in the field, and their self-regulating output, which provides more heat where it is needed. Self-regulating cable uses conductive-polymer technology in both monolithic (solid core) and fiber (polymeric fiber wrap) heating cables. The heating element is made of polymers mixed with conductive carbon black. 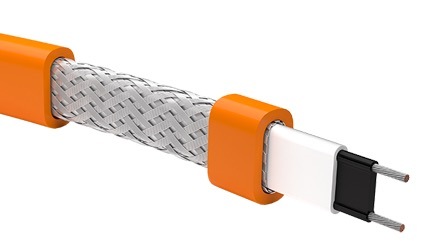 This special blend of materials creates electrical paths for conducting current between the parallel bus wires along the entire cable length. In each heating cable the number of electrical paths between the bus wires changes in response to temperature fluctuations. As the ambient temperature surrounding the heating cable decreases, the conductive core or fiber contracts microscopically. This contraction decreases electrical resistance and creates numerous electrical paths between the bus wires. Current flows across these paths to warm the core or fiber. The document below provides an excellent detailed description of self-regulating cable, its application and selection. Self Regulating Heat Trace Guide from Instrument Specialties, Inc.